Hello Aspirants, looking for AFCAT 2 2017 Answer keys,Cutoff marks So done with your AFCAT (Air Force Common Admission Test) 2 2017 exams for grant of Short Service Commission in Flying Branch and Permanent/ Short Service Commission (PSC/ SSC) in Technical and Ground Duty Branches for the following courses for Men and Women which was held on 2017 now curious to check your AFCAT 2 2017 Answers keys. We have provided the Answer Keys for the sets A, B ,C and D and also the previous year cutoff marks in this article candidates can checkout and compare your answers with the keys. Also IAF declares the answer keys on its official website too www.careerairforce.nic.in but it takes time.Checkout below and feel free to ask questions in the comments below. A Large number of candidates appeared for the AFCAT 2 2017 written examinations for grant of Short Service Commission in Flying Branch and Permanent/ Short Service Commission (PSC/ SSC) in Technical and Ground Duty Branches for the following courses for Men and Women which was conducted by IAF on 2016. AFCAT exams are conducted twice a year in which number of students around the country apply for the exams. The answer keys for the examination are released by the number of coaching classes and it is declared by IAF too on its official website for all the papers English, General knowledge and Elementary Mathematics which will help students to check their performance in the exams and get the idea of their scoring for AFCAT. The Indian Air Force Common Admission Test or AFCAT Examination is Entrance Exam for Joining the Air Force. Through This exam one can join the following three branches of the Air Force. In AFCAT Exams for every right answers you score 3 marks and for every wrong answer 1 mark is deducted.There is no penalty for unsolved questions. General Awareness – History, Sports, Geography, Environment, Civics, Basic Science, Defence, Art, Culture, Current Affairs, Politics etc. Verbal Ability in English – Comprehension, Error Detection, Sentence Completion, Synonyms, Antonyms and Testing of Vocabulary. Numerical Ability Test – Decimal Fraction, Simplification, Average, Profit & loss, Percentage, Ratio & Proportion and Simple interest. Reasoning and Military Aptitude Test – Verbal Skills and logical..
Generally AFCAT exams are of 300 marks in which a large number of candidates around the country appear. 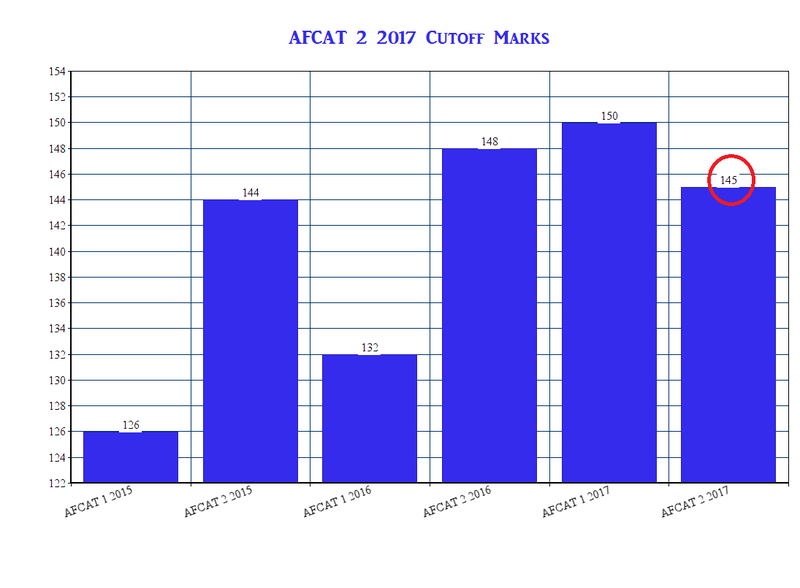 So the expected cutoff marks for AFCAT 2 2017 would be in between 140-150 marks. Candidates who solved questions 60-70 which makes 180-190 marks with accuracy will be clearing exams easily. Below we have given the AFCAT 2 2017 Answer Keys for the different Sets A,B,C,D which was held on 2017. Aspirants need to check the answer keys carefully with their respected sets they appeared. IAF uploads the answer key for the exams after the exams are over on its official website but it takes time so we have published it on our website. Check the answer keys properly and carefully and match the answers with your own sets Shift which you appeared for the exam. Check your Performance and wait for the results to be announced by IAF. published in the months of December and June respectively. depending on the number of vacancies available in various branches of the IAF. So this was all about AFCAT 2 2017 Answer Keys All Sets, cutoff marks. Hope you would have checked your answers with the keys we had provided for all the different sets. Aspirants keep following us for AFCAT 2 2017 results we would be updating it soon on our page once its officially declared. Hope you would have checked your performance in the examination. For any questions or queries regarding AFCAT 2 2017 Answer keys, cutoff mars comments below.